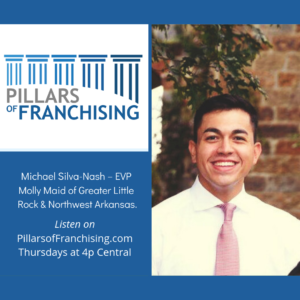 Michael Silva-Nash – EVP Molly Maid of Greater Little Rock & Northwest Arkansas. Michael Silva-Nash is the EVP of EVP Molly Maid of Greater Little Rock and Molly Maid of Northwest Arkansas. His family purchased the Central Arkansas location in 2005 after his mom had worked in the business as a Home Service Professional and then later as Office Manager. They have grown that location to the third largest Molly Maid franchise in the United States. Most recently, they acquired the Northwest Arkansas operation in 2017 and it is flourishing in the backyard of WalMart’s Home Office. Michael has also been heavily involved in politics, including working in Washington, D.C for a Congressman and later assisting in successful election campaigns for state-wide office.